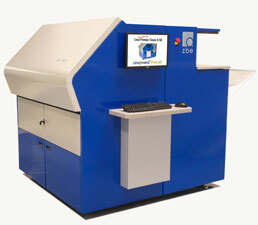 The Chromira SE Lab is fully upgradeable to obtain the cutting, sorting, and collating benefits of the Chromira 5x ProLab. These automatic capabilities will result in an enhanced workflow significantly improving turnaround, accuracy and delivery. Material Size: Daylight loading of 30" (76 cm) down to 10” (25.5 cm) wide rolls. Print Sizes: 3.5 x 5" (9x12 cm) up to 30 inches x 164 feet (.76 x50 m), full bleed or with borders. Image files scaled on-the-fly to any desired print size. Print Speed: 24” per minute. Equals: 1440 – 4x6", 480 – 8x10", 240 – 11.x 14", 69 – 20x30", 35 – 30"x40". Image Resolution: 300 PPI; 425 PPI visual resolution with ZBE's patented LED Resolution Enhancement Technology.